Signs of early settlements have been found around Beachamwell with the discovery of Prehistoric flint scrapers, a Neolithic flint axe, Bronze age knives and pottery and Roman and Saxon jewellery and coins. To the north west of the village there is also a Bronze age burial mound known as Hangour Hill. Nearby is the Devil’s Dyke, a large Saxon earthworks extending 9 miles between Caldecote and Narborough, which was built as a defence against the Danes. A medieval limestone cross base on the east side of the church wall indicates a boundary marker for Glebe land and was moved to it’s present location in 1981. The parish as we know it today was in both the Hundred of Clackclose and South Greenhow, the spring once ‘a fine stream’ at Shingham divided the two. The village, like many others in the area, really began to develop in the late Saxon era. St Mary’s church with it’s thatched roof and Saxon tower is over a thousand years old was mentioned in the Domesday book of 1087. All Saints’ church of which only a few ruins remain was built in the 12th century. In the days of William the Conqueror there were two separate manors, one was known as Bilcham, Bicham or Bycham and had St Mary’s as its parish church. The other known as Wella or Welle, names indicating the presence of springs, was on the south side adjoining Shingham and had All Saints’ as it’s parish church. The two manors were joined together in 1568 and formed the village known today as Beachamwell. A big debate still rages among some of the older residents with regards to the correct spelling some thinking it should be Beechamwell. In 1959 George Greef, who kept the Post Office, would not guarantee delivery if it was spelt with a double E. The annual parish meeting in 1977 voted that the official spelling should be Beachamwell but a glance at the local road signs will show that the matter is still unresolved! There is mention of a Hall at Beachamwell as early as 1532 when Thomas de Grey was the owner. A new one was built by John Motteux at some time in the late 18th century. Pierre Antoine Motteux, his father, originated from France, and was a tea merchant who also wrote plays and poetry. He met an untimely end on his fifty-eighth birthday when celebrating with friends who hung him up for fun. A procession outside attracted their attention for longer than it should, by the time they remembered their poor host he was dead. In the late 18 century John Motteux had purchased Beachamwell and Sandringham estates as an investment, He died in 1793 and his son inevitably also named John inherited. The village was transformed in about 1815. Wattle and daub hovels were replaced with 22 cottages built from bricks from the kiln on the Warren, a school was also built in 1835. He also was a great benefactor to the Church. In 1826 John Motteux won the ‘Large Silver Medal of the Horticultural Society’ for the cultivation of Fruits in his garden at Beachamwell. When he died in July 1843 he left his estates to the Honourable Charles Spencer Cowper, son of his greatest friend the fifth Earl Cowper, apparently in gratitude for his care after a cab accident. He resided occasionally at the Hall but spent most of his time at Sandringham until he sold it in 1861 to H.R.H. the Prince of Wales later to become Edward VII. In 1851 the Beachamwell estate had been sold to Joshua Fielden owner of a very successful Lancashire cotton mill which in 1846 was producing 400 bales of finished cotton a week. The estate was actually bought as an investment, but his son (also Joshua) married Frances Thom in 1875 and was exiled to Norfolk by his father supposedly for marrying beneath him. He detested living in such a flat countryside and took to drink and died aged 44 in 1892. The Hall burnt down in 1903 and had been rebuilt on similar lines by 1906. After Joshua Fielden died his wife had continued to live there with their daughter Constance who married Col Patrick Villiers –Stuart from Ireland in 1908. In 1910 Mrs Fielden opened a Post Office account with the sum of 10/- for every child born that year to mark the occasion of Constance giving birth to a daughter Patricia. Among those to receive this gift were Wilfred Ward, Wally Osborne, Fred Palmer, Len Atter, Clarence Butters, Kenny Barrett and Nora Lambert. After the death of Mrs Villiers-Stuart in 1966 the Hall almost became a finishing school for young ladies but instead was sold to Mr Rex Carter in 1968. It was resold in 1989 and Mr Bonning is now the present owner. 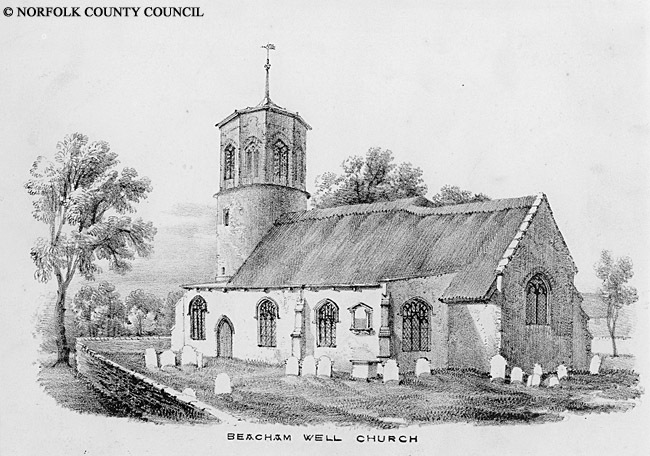 Within the present extent of the parish of Beachamwell there were once four churches and a chapel. St Mary’s is the oldest and the only one still in use. It a very attractive little thatched church with a round Saxon tower capped with an octagonal belfry. Built in about 900 AD by the Saxons it is mentioned in the Domesday Book (1087) when it was endowed with 30 acres of land and the patronage belonged to the Lord of the manor then held by one Robert Bigot and was called The Manor of the Chervills. Since then the patronage has alternated between the Lord of the Manor and the Sovereign until its sale in 1961. The first recorded rector of St Mary’s was John de Bircham in 1278. Church registers date back to 1558. The octagonal tower above the round tower was added in the 14th or 15th century and housed two bells. In the early 1800s John Motteux was a great benefactor not only to the village but also to the church. He added the south aisle and the eastern extension in 1832 and all the pews were renewed in 1835. Restoration work was carried out in 1886 and included a new east window. The altar came from St Botolph’s at Shingham. The clock on the north wall was given by Canon Sutton and was presented and dedicated in November 1924. The thatched roof constantly needs attention and was last renovated in 2000. Only a few ruined remains indicate where St Johns once stood about half a mile to the north west of St Mary’s close to St John’s farmhouse. It was thought to have been built at the beginning of the 14 century, the first recorded rector being Robert de Suthfeld in 1304 and church registers date back to 1346. St John’s became redundant in 1558 when it was united with St Mary’s and was allowed to fall into disrepair and eventual decay. Circa 1750 it was reported that some poor people had built themselves cottages on the site and some of the materials may have been used to build St John’s farmhouse. St Botolph’s Church at Shingham was consolidated with St Mary’s in 1800, at one time in the late 1800s it had no roof. The main part is Norman but it is thought there may have been a church on the site previously perhaps founded by St Botolph on one of his missionary tours in the 7th century. The nave has 15th century benches and the pulpit is 17th century. The altar was moved to St Mary’s where it is still in use. St Botolph’s was renovated with a copper roof in the early 1900s. There was never any tower or chancel but a bell cast by Thomas Newman in 1738 was formerly hung in the west gable. When the church became unused the bell was stood outside in a crate but was taken inside the church for safekeeping after the bells at Barton Bendish, which had also been stood outside, were stolen in 1987. In 1949 Mrs Villiers-Stuart offered some land to extend the churchyard which is still used for burials as there is no longer any space at St Mary’s. St Botolph’s has been only occasionally used for services in summer time as it has no heat or light. A Wesleyan chapel at Shingham was built in 1892 and closed in 1986, it has now been converted into a private house. Until John Motteux bought the Hall and the surrounding land most of the dwellings were only made from wattle and daub. He was a great benefactor to the village improving the housing and church and building a school long before it was a legal requirement to provide education. In about 1815 some cottages were built from local bricks and are still standing today either side of the Green. Then they were in pairs but now a number of them have been converted into one house. A pair of thatched cottages stood behind the end pair of cottages (now Beechamwell Cottage) on the north side nearest to the pub. Others stood in the meadow next to the Hall and up on the Warren. In the 1920s a few council houses were built in Chestnut Walk and after the Second World War a number of council houses and bungalows were added around the village. Further development took place in the 1970s with the building of houses and bungalows at All Saints’ Way and more recently, in 2001, a barn conversion and several houses have been built beside and opposite Malthouse Farm. Conveniently the Post Office still survives in it’s original position and until fairly recently also served as a shop. The village well, opposite, became redundant when mains water arrived in the 1950s when Beachamwell also ceased to have it’s own bakery. The roads through the village were not asphalted until 1936. Beachamwell also had it’s own garage between 1956 and the 1980s. The school was built in 1835 and was enlarged in 1875. Children could start school at the age of three and normally left at 12 or 13. In the 1870s children had to pay 2d a week for their schooling. As many as 90 children attended at one time requiring three teachers. Once a year a school outing was arranged. A traction engine drawing two wagons full of children, teachers and helpers would take them to Narborough where they boarded a train to Hunstanton or Yarmouth for their day out. Sadly the school closed on July 26th 1996 by which time there were only 9 pupils attending. In 1891 a reading room was opened in a cottage lent by the owner of the estate Joshua Fielden. When the Hall burnt down in 1903 the Clerk of the Works commandeered the cottage and the reading room was moved next door to a room at number 19 a small bungalow in the Street and the home of Horace Rix. The pub, built about 1820, has had a chequered history during the last century. It is not known when it was actually built. For more than a century it was called ‘The Cooper’s Arms’ which is possibly a corruption of the surname Cowper owner of Beachamwell Hall in the mid 1800s. In 1974 the pub closed down for two years and was re-opened as ‘The Great Danes Head’ of the canine variety. Later, in 1993, new owners preferred that the pub sign depicted A Great Dane of Viking origin and local resident Mark Powell was commissioned to repaint the sign. On the other side of the sign however he re-created a scene depicting what the pub had for decades been fondly known as ‘The Hole In The Wall’. Now no longer obvious there was once a serving hatch in the wall of the pub through which beer was handed out. Until comparatively recently publicans combined their work with another profession quite often serving also as the village blacksmith and the smithy once stood beside the pub. Another building next to the pub served as a butcher’s shop. From the early 1920s until October 1931 it was run by Walter and Edie Ward. Two sheep and a pig were normally killed on a Thursday. After they had been paid on a Friday the men would collect their meat. An old wooden First World War army hut initially served as the village hall. This was taken over as a billet for soldiers during the Second World War. After which it returned to it’s former use and the Women’s Institute, which was formed in 1947 became regular users. An appeal fund to build a new one was started by Col Villiers-Stuart soon after the war but by 1960 the wooden hall had become so dilapidated that further action was needed. It was suggested that each household should contribute 2/6 a week and also buy some bricks resulting in the opening of a new Hall in 1963. Originally it was heated by a coke tortoise stove which was removed in 1980. The new Hall was formally named the ‘Memorial Hall’ in memory of those from the parish who had fallen in the Second World War. From 1972 until 1983 the village Hall was also used as the school dining room, previously lunches had been provided at the Pub. Major refurbishment was carried out in 1994. Besides the WI the Hall has been home to the Brownies, Play groups, Social and Youth Clubs as well as hosting many other functions. The village sign outside commemorates the Queen’s silver jubilee and was unveiled in July 1978 by Mr Naylor from Warren Farm. Many villagers know nothing of the history of the Memorial Hall. The following article was published in Group4 News in March 2011 from a booklet written by Ruth Rix. Until 1918 the village had no independent meeting place. There was a Reading Room, a common occurrence in local villages, but this was a room in a bungalow tenanted by Mr and Mrs Horace Rix and which was commandeered by Mr and Mrs Joshua Feilden, the owners of Beachamwell Hall and of Beachamwell and Shingham villages. After the First World War an old Army hut was purchased for use as a village hall, and in the years between then and the Second World War it saw service as the village Community Centre, being used for whist drives, socials, receptions, council meetings etc. In 1939 the Army took over the hut and it was used as a billet for soldiers. Wilf Williams was one of them and remembers a night of high spirits when a rifle was fired, resulting in a bullet hole in the roof. After the war the hut reverted to its former use and gained a new lease of life in 1947 with the formation of the Women’s Institute. Mrs Sanderson senior, from Norfolk Federation of W.I.’s was the official representative, Mrs Villiers-Stuart the first president, with Mrs Ruth Rix, vice president, Mrs C Palmer, treasurer and Mrs English as secretary. The Institute functioned for many years, giving immense help to the village by entertaining the senior citizens to meals and concerts on three occasions and holding monthly meetings, sometimes with members from surrounding villages. However, numbers gradually fell, and, in due course the Institute was disbanded. In 1959 the Brownie pack was started and run by Mrs Ruth Rix. This continued until 1978 when Mrs Irene Ranner took over and she ran it until 1981, when the pack merged with the Swaffham pack. By 1960 the hut had definitely seen better days and it was decided that it should be sold and a brick structure be built on the site as a memorial to those local people who has fallen in the Second World War and who were commemorated in St. Mary’s Church. The late Col. P. Villiers-Stuart has started an appeal fund just after the war to finance a replacement and the decision was taken to request 2/6d per week per household and people were also able to contribute by buying bricks! Money was also raised by the local children who went round the village with a hand-cart collecting old newspapers, which were stored at Malthouse Farm and sold by the ton. The ‘hut’ was sold to Geoff Allen for £500 and the village was without for some years. The land designated for the new hall was owned by Mrs Villiers-Stuart, daughter of Mr and Mrs Feilden, and let to Mr Palmer, the Beachamwell Hall chauffeur, who also ran a garage in the village. He, in turn, sub-let it to Mr Brancham, who kept pigs and hens on it. A new home had to be found for the animals on completion of the sale. The land was initially sold to George Adcock, Raymond Rix, and Miss Hilda Chappel for £10 and subsequently conveyed into the names of David Scott and William Holding as Trustees, in August 1961, by Messrs W.F. Smith & Co of Watton. Plans were drawn up based on a similar hall recently completed at Woodrising, near Norwich and building tenders were invited. Peter Gore-Rowe made a concrete model of the proposed building and this was exhibited at the annual garden fete held in the grounds of the Hall. It was hoped to have tennis courts and a bowling green in due course and the hall was designed with a covered balcony. Sam Sutton had to resign as secretary to the old hall to enable him to submit his tender. In the event he was undercut by £200 and the contract was given to Covell and Sons for £2,700. However, at the insistence of Mrs Villiers- Stuart, Sam had the contract to add the balcony at a cost of £1,000. When the first load of bricks was delivered there was nobody available to unload the lorry. The driver was about to leave when he was spotted by Hazel Seales who lived in the end cottage in Old Hall Lane. Together with Mrs Lottie Smith and her daughter Pauline, (wife of George Adcock), they helped unload the vehicle. The new building opened in 1963 but nobody can be sure of the actual occasion. It is thought to have been formally opened by Mrs Villiers-Stuart, Miss Chappel, headmistress of Beachamwell First School and Miss Lewis of Norfolk Education Committee during the Fete in August. The first officially recorded meeting was on October 9th 1963 when the Brownie pack met, after several years of using the school premises. In 1964 the hall was officially renamed ‘The Memorial Hall’ and a hanging glass sign with blue lettering was made by Peter Gore-Rowe and put in position early in 1965. He was also responsible, along with George and Norman Adcock and Bernard Woods for making up the road to the hall. When the hall was built it was heated by a tortoise stove, which, whilst efficient, was coke fired, and, hence, rather dirty. An annual spring-clean was undertaken by a band of volunteers armed with scrubbing brushes, pails, doilies, polish and dusters. The following year, 1965, Mr Maurice Mason lent a tractor and driver to prepare the green for seeding and this work was completed by Norman Adcock. In 1966 a plasterboard ceiling was installed to alleviate some of the cleansing problems and improve the efficiency of the heating. On September 5th 1967 five boys joined the Brownie pack! Later they became the Cobweb of the Swaffham Cubs and eventually Mrs Eirene Barney formed the Beachamwell Cub Pack. The following year a chestnut tree presented by Mrs Nemon-Stuart, widow of Oscar Nemon, sculptor, and daughter of Col. and Mrs Villiers-Stuart, was adopted by the Brownies and a log book of its growth was kept and maintained with other Brownie data until April 1976. During this time the village was subject to power cuts on a regular basis and entertainment in the hall suffered. In 1970 a show put on by the Cubs and Brownies was lit with emergency lights running from car batteries, torches and candles. At the time of building the hall the education Authority made a grant towards the cost and in 1972 they rented the hall for use as the school dining room. The hours were 11.30 to 2.30 at an annual rent of £75 for 5 years. As a result, improvements were made to the kitchen with ovens being installed. Further improvements were made in 1982 and the rent increased to £100 per annum from December of that year, but in September 1983 the contract was terminated by Norfolk County Council and the large sinks and ovens removed. They were Beachamwell Social Club, meeting alternative Thursday afternoons. In 1979 they presented the village with a large Union Flag to fly from the flagpole donated by Mr John Anderson. At a Parish Council Meeting on May 22nd 1978 the design for a new village sign was approved. It had been drawn up by Charles Hanson to commemorate the Queen’s Silver Jubilee and its manufacture was organised by Glyn Sims and n most of the work carried out by Barry Rowe of Demax in Narborough. An oak post was shaped by John Sanderson and the holes for the sigh dug by Brian Cockerill. The sign was sited in the North East corner of the Green opposite “The Great Dane’s Head” and was unveiled n the July by the then resident of Warren Farm, Mr Naylor. Subsequently, the sign was moved after much criticism of the original position and re-sited to the north of the hall, midway between the road and the hall. The move was carried out by Claud Sutton who made up a brick and flint plinth with four seats around it, to a plan by Mr Hanson. In October two oak trees were planted to commemorate the work done by George and Norman Adcock. The planting was carried out by two of the village children, Tim Mycock and Donna Ward, daughter of the landlord of “The Great Dane’s Head”, using a silver spade presented to Donna’s grandfather when he was Sheriff of Nottingham (Major). Unfortunately, the trees did not survive for very long. Tim’s great grandfather recalled planting the poplars along the Swaffham Road and Back Road. The following year, silver birch and flowering cherry trees were planted during a floodlit ceremony to mark the 25th anniversary of the 1st Beachamwell Brownie Pack. The same year the Women’s Institute reformed with Mrs Irene Ranner as the first chairman, and with twenty five members. The hall was also connected to the main public sewer system, at a cost of £8.50. 1980 saw the removal of the tortoise stove by Glyn Sims, Johnny Cooper, Michael Mycock and Ian Revell. The concrete base was broken up and a new section of parquet flooring supplied and lain by Glyn Sims. The old flue pipe was removed, amidst much mess, leaving a hole in the roof, which was covered by a pail, put up there some time later by Michael Mycock. It is still there! A new playgroup formed during the year, with children coming from the surrounding villages. Much of the equipment came from Mrs D Cuttel who had organised the previous playgroup held at “Friar’s Oak”. In 1981 the open balcony was bricked up and incorporated into the main structure of the hall forming a small stage. Michael Mycock and Eddie Scales sanded and re-polished the floor and the hall was redecorated by the committee and other volunteers, with Mrs Mary Scales painting a mural covering the whole of the west wall. In April the Parish Council voted to have the roadway from “The Great Dane’s Head” made up and a levy of 1p per head on the rates was passed to finance the work. In 1983 the access track from in front of 43 The Green to the first cottage in The Street, and used by all the trades people, was removed and seeded with grass. The hall continued to function without major incident until 1986 when a youth club was started by Marilyn Brancham and this was later taken over by Mrs Alexander until some time ion 1990. It restarted under the direction of Mr Peter Gladman and Miss Ann English, with much help from Mrs Jeanette Gladman and has continued, with the first pantomime being staged in 1994. In 1991 the village newsletter was started by Miss Ann English, when she was chairperson of the hall. A copy of the village sign was drawn by Mr Mark Powell and the front cover design by Glyn Sims. The newsletters have become a popular feature of the village, providing news for all section of the community. In 1994 a major refurbishment of the hall took place, following recommendation by the Department of the Environment. An additional ladies toilet and a vanity unit were installed, and the kitchen was much improved with doors being fitted to the cupboards. The main work was carried out under the supervision of Mr David Guild. The original cheque used in payment for the Memorial Hall has been framed and now hangs in the main hall. The owners of the Hall and the estate have been explained in the History of Beachamwell but although Joshua Fielden was Lord of the Manor, records show that in 1883 the Hall and shooting was let to a Mr Reginald Heygate. Patricia Villiers-Stuart, a descendent of the Fieldens, married Oscar Nemon a famous sculptor but they never actually lived at the Hall after their marriage. Her mother Constance was famed for her flower arrangements. In the 1800s most of the cottages in the village had been built to house farm workers or those needed to service the Hall in addition to the servants who lived in. Workers who lived in the Laundry Cottage at Shingham did all the laundry for the big house. In 1845 John Chambers and John Fuller were listed as farmers and William Smith was the blacksmith. About this time there were also 3 warreners, 1 gamekeeper, 3 shepherds, 2 or 3 millers, a shoemaker, a bricklayer, a carpenter, 2 bakers, a tailor, 6 dress makers as well as a rector, a schoolmistress and a policeman. About this time there was also said to be a factory in Shingham Wood making clogs which were sold to the Midlands. In 1837 a number of pauper immigrants from different counties arrived in Canada on board a two masted square rigged sailing ship named the Anne. Seven were recorded as being sent under the Poor Law Commissioners from Beachamwell aided by their landlord, the sum of £24/13/4 having been remitted to be distributed among them on their arrival in Canada. The ship sailed from Lynn on April 20th with 154 passengers on board and arrived in Port Hope, Canada on June 10th. Also on board from Beachamwell was a family consisting of Robert and Ann Hawks and their children John 20, William 18, Mary 17, Susan 13 and Isaac 12. Hawks was a miller by profession. John Motteux wrote a letter dated April 17th (three days before their departure) to a Mr A. C. Buchanan recommending ‘this party to your protection and in directing their project up country’. John Motteux continued ‘there also goes by the Anne a shepherd from this parish named Elliot Boughton taking with him a nephew William Boughton, a young man about 20. These two latter ones on their own account’. Back home in the village itself the Rix family ran the shop and post office for several decades in the early 1900s followed by the Greefs. F.Osborn baked bread for the village, his son Wally taking over from him. Wilfred James Horn, whose family originated from Barton Bendish, combined the jobs of publican and blacksmith. In fact a pony and trap could be hired from the pub for 2/6 a day but the donkey, also kept there, cost only 1/6. Bicycles could be hired from Mrs Hovell on the Green for 1/- a day. In the 1920s forests were planted on the once open land of the warren and new houses and bungalows were built at Drymere for the many people employed on the forestry. In 1927 Sid Palmer, the chauffeur at the Hall, ran a cycle business and in 1956 opened Greenways garage at the junction of the Shingham and Beachamwell roads which he continued to run until 1972. Since the mid 19th century the population, including Shingham and Drymere seems to have fluctuated between about 220 and 350. The people of Beachamwell had several near misses from planes crashing during the last war. The closest was when a Mustang came down in the field where Annie Lambert kept her chicken near the school. A Ventura crashed at Larch Wood, a Mosquito on the Warren and a Flying Fortress landed in a field along Murgot’s Lane to Eastmoor. All managed to avoid the houses in the village. During the last few decades the Rixes, Sandersons and Adcocks have farmed the land immediately surrounding the village. The whole structure of the population has changed from revolving round employment in the Hall and on the farms. Families are much smaller and only a handful of people now actually work in the village. Back in 1851 there were 54 dwellings in the parish and a population of 310. Of these 104 were children of 14 or under. Susan Pearce was then school teacher and John Pearce blacksmith. The oldest inhabitant was Ann Butters who was 93 but in those days very few people attained such a great age. Now there are far fewer children than there were and many more people who have achieved in excess of their three score years and ten. There are not many people now left in the village who were born there and whose parents and grandparents also called Beachamwell home. It is interesting to note what a contrast there used to be between the neighbouring village of Barton Bendish and Beachamwell when it came to farming. The Barton Bendish Estate consisted of a dozen or more small farms but until comparatively recently the 4,000 acres or so of land around Beachamwell almost wholly belonged to the Lord of the Manor and mainly consisted of two or three large farms. In 1851 Frederick Newman farmed Warren Farm. John Fuller farmed 1,100 acres and employed 25 labourers. William Smith farmed 35 acres and employed one labourer and one boy. A blacksmith/journeyman lodged with him. 3 warreners and a gamekeeper were also included in the list of professions. In 1881 Claxton Mason was tenant of St John’s which then extended to 1,800 acres and employed 40 men and 15 boys. Robert Battle was at Malthouse which also extended to 1,800 acres but he only employed 24 men and 2 boys. Records for 1881 show that there was only one warrener but 5 gamekeepers indicating the growing popularity of shooting in the late 19th century. These two farms were let by the estate until 1972 when the tenants at that time (Mr Sanderson at St John’s and Mr Rix at Malthouse) were given the opportunity to purchase which they did. The land around Beachamwell is light and sandy with subsoil of gravel and chalk. Wheat, barley and turnips were the principle crops along with some pasture. In common with many Breckland estates there was a thriving rabbit warren which was mentioned as early as 1275 and which in the mid 1800s extended to about 2,000 acres. There were several warreners cottages dotted about on the Warren. However much of this area was planted with conifers after the First World War and a new community was created for the forestry workers at Drymere. Because planting trees and the care of them was seasonal work (I believe work was only guaranteed for 150 days a year) each house or bungalow built there was allocated 5 acres of ground so that workers were able to supplement their income. Agriculture and forestry were and still are the main businesses around the village although only a fraction of the number of people are now employed on the land. Probably because the farms were so large mechanisation began to take place in the 1930s well before many other farms in the area. Even so in the 1940s, 22 men still worked at Malthouse Farm when the wage bill came to about £40 a week. Forestry workers were on a slightly higher wage. With many of the men serving in the Second World War the women of the village filled their places both on the land and in the forest doing a variety of work, much of it heavy. Shooting is a popular sport on the land surrounding the village. St John’s Farm is shot over by the Sanderson family, Malthouse Farm by the Rixes and the land around Shingham is utilised by Heygates. For centuries rabbits on the 2,000acre Warren would have provided some sport as well as food until it was cultivated in the 20th century and much of it planted with trees. In 1851 there were 3 warreners and one gamekeeper employed in the parish. 30 years later however, in 1881, records show that there was only one warrener but five gamekeepers, maybe they also had to take care of the rabbits as well as the pheasants and partridges. The Hall and shooting on the manor was let by Joshua Fielden to a Mr Reginald. B. Heygate in 1883. At that period shooting had become very popular and at the end of the century estates like Beachamwell would have hosted lavish shooting parties. It is recorded that John Motteux also entertained large shooting parties and ordered children from the school he had recently built ‘to be distributed about to brush the coverts like so many spaniels’. On one occasion a cook at the Hall was taken seriously ill on the morning of a big shoot. Motteux sent post haste for the doctor with the instructions to ‘bolster him up for a few hours till dinner is served then let him die as soon as he likes’. In actual fact though John Motteux was really a very kind man and it is said that on his death he left each of his servants a handsome legacy and annuity. In 1937, 4,000 acres of land and 3 cottages which extended into the parishes of Beachamwell, Barton Bendish, Shingham and Marham was let to a Mr William Webster Watts for £500 a year. Also in 1938/39 one thousand acres of land around the Hall were let for shooting to Alexander McNeill from London for £200 which included one house for a keeper. The West Norfolk Foxhounds meet once or twice a year at the pub and hunt the surrounding area. When the Fieldens lived at the Hall they also played host to the pack. Earlier in the 1900s the village found sufficient support to have both football and cricket teams to play local villages and quoits was played in the pub yard. There was also a tennis court opposite the village green not far from the pub. Now about the only village sport (if it can be called that) to have survived, is dominoes in the bar. The above extracts are reproduced with the kind permission of Jill Mason.